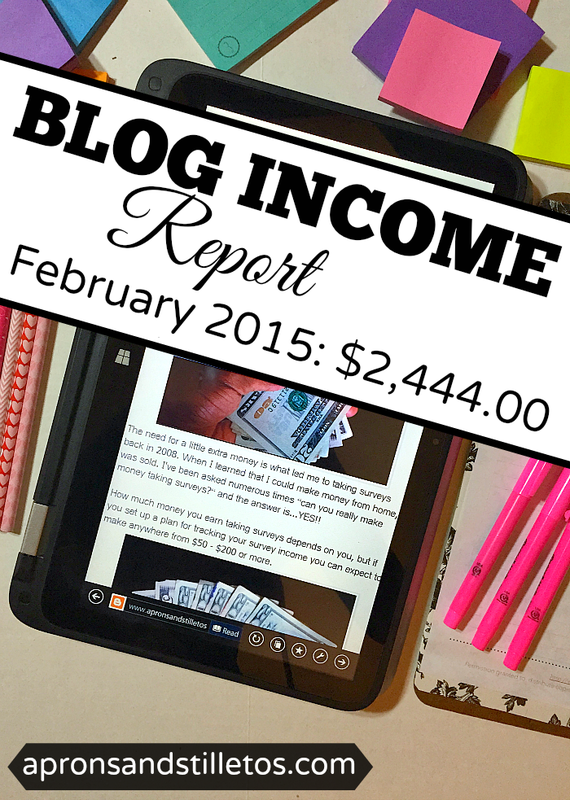 This is month two of me sharing my blog income report and I hope my January blog income report gave you some inspiration in regard to the different ways you can make money blogging. My greatest goal in sharing these reports is to give you an idea of the kind of money you can make blogging. February was a slow month for me because I was on bedrest for three weeks out of the month. Even with me being sick, I did pretty well in terms of actual income as well as generated income. Because I don’t want these reports to get super lengthy, I only share income I’ve actually been paid versus accounts receivable and revenue generated. To start, my goal for February was to increase my pageviews. This is even more important for me than increasing income at the moment. I ended January at just under 7,000 pageviews and this month I ended at a whopping 15,460!! I practically increased my pageviews by over 100% from January. Here’s my traffic and social media statistics for January 2015. All of my blog and social media stats have increased from last month, so I am excited about that. The biggest increase I have seen is with my Twitter followers. Since I started using Manage Flitter to kick my Twitter growth into overdrive my audience base has been growing. Everything I did to jumpstart my growth was from the ebook Grow Your Twitter for Bloggers. It’s the most comprehensive resource I’ve ever seen on the subject. As you can see from the graph below, I started the month out at just under 700 Twitter followers and was up to 1809 by February 28th. I gained 1130 engaged followers who are retweeting my content and interacting with others on Twitter all by using Manage Flitter and implementing the strategies from Grow Your Twitter for Bloggers. By the end of 2015 here’s where I’d like my site statistics to be. Here’s my income by category for February 2015. Here’s my expenses for January 2015. What I’ll focus on next month. In March I will focus on creating Easter and Spring themed recipes, and tutorials that will be Pinterest friendly. One thing I’ve learned is that I need to become even more focused on the planning side of my content and content marketing strategy. I see that I’m more focused and use my time more productively each month with a detailed written plan. Join my mailing list and be notified when my March blog income report is published. I love being a digital content creator. I love branding and marketing. And I love being an entrepreneur. I also love helping others fine tune and monetize their brands. I love helping entrepreneurs map out plans for income and growth. I’d love to work with some new entrepreneurs in 2016! Whether you need fresh pair of eyes and some guidance in your business plan, thoughts on how to make your brand more appealing to PR reps or ideas on methods of monetization. I can help. Check out the packages I have available or email me and we can brainstorm customized package for your brand. Really nice post to start blogging. This article is very useful. I saved it into my bookmarks. Thanks For Sharing This Useful Information .Would come back to visit soon, again Thanks. I am so inspired by these numbers. I have just had my blog for 30 days and am trying to figure out how to make money. I think I am too new to get any ads and no one is clicking on my Amazon affiliate links. I will keep persevering though! Thank you so much for sharing this! It is an inspiration to someone like me that is trying real hard to make money from blogging. So many people are afraid to mention numbers and money. Thanks!!!! Thanks for your candor and honesty – this is great information. Anyone who is interested in the pet space, I am a member of the BlogPaws Pet Blogger Opportunity Network. Wow this is impressive! I really need to take advantage of affiliate marketing. So inspiring! I am in awe of your affiliate income, that is awesome! I have been blogging sporadically for years, but have only made $25 with AdSense and only have about 50 followers. I would like to grow my audience and begin somewhat of a supplemental income – what would your suggestion be as to the first step to take, who to sign up with, etc.? Hi Stephanie. Order my Affiliate Matketing Action Report. I create a customized game plan for you which includes what networks would be a good fit for your niche & blog. You’re doing great! Well on your way to reaching your goals for 2015. I also use ManageFlitter to manage my Twitter account, as well as Unfollowers.com (which also works for Instagram). Congrats! Looks like you had a great month! That is pretty impressive. Great Job! Truly inspirational! Congratulations on your success! Wow you did fabulous. May I have your secrets. Of course Rebecca. Let me create an affiliate marketing plan for you. Take a look at my services listed in my post. Saidah, this is awesome! I use ManageFlitter too and I love it, it does a great job at finding the right people to follow and unfollow. Also, your affiliate earnings are crazy! Do you have a systemized way for keeping track of all your affiliate links? I do Mei. I share my tracking system in my webinar. I have a link to it under Product Sales in my post. I love your goal setting! It is so focused and I need to learn from it. I have no idea how much I made and I should. You did an amazing job! That is such a great accomplishment to make that much! Awesome job! Right now I'm focusing on improving my blog traffic as well. I'm glad to see you use Panthera Network and Escalate Network, those are my favorites. Keep up the good work! Wait. This is so cool. We're currently at similar levels stats wise, and I'm now COMPLETELY inspired by your report! I'd love to chat with you more in depth about it if you'd be game, because now I am so motivated! Contrats! I am working to slowly grow my blog after I lost one of my two jobs and this is inspiring! Congrats on your progress! I have been blogging mainly to support my service business but since the beginning of the year am transitioning into more affiliate and brand work. This is inspiring to see and tracking is a great way to grow ! What we measure grows. I plan to incorporate this info my monthly posts as well. Good gracious my mouth won't shut! This is amazing and awesome. Good job.. hard work pays off! Congrats! You had a excellent month. Your hard work and dedication is paying off. Great report Saidah. I would love some help with increasing pageviews. I would love to try affiliate sales but my pageviews are low. This was so impressive and informative for me. My numbers are slightly above yours, but I didn't think I had enough to make money off blogging yet. Well, you proved me wrong!!! Can't wait to look closer at how you have accomplished this! Congratulations! I make most of mine through sponsored posts and can't do Amazon because of where I live. Maybe you'll pass the 3k mark next month. This is impressive! Congrats! I signed up for amazon affiliate but have not used it. And I got rid of google Adsense on my site since I wasn't making any money. I need more time in a day to write, post, do social networking AND also monetize! I really love reading other bloggers' income and expense reports. Thanks for sharing and good luck as you work toward new growth! Whoa! That's amazing! I can definitely learn from you! Wow you certainly earned a lot of money last month. Congrats on that. This helps a lot! Quick question. Why do you use feed blitz instead of a free service? I like the customization of Feedblitz and my other blog has over 3K email subscribers and I don't know of any email service that is free for over about 2500. Wow! This is amazing!! I'm going to try and follow in your footsteps! Dang girl!! Good job!! 2015 is looking good on you! That is great that your numbers are increasing! Thanks for sharing these details- it's so nice to see that others are becoming successful as well! Congrats on your numbers increasing. And congrats on the nice income numbers too! I find this information so interesting. I have more traffic and followers but I am making less money! It's always interesting to see how each blogger's numbers pan out. Definitely going to reference this later. Congratulations on your success and good luck! Rose I'm sure you could benefit from me taking a look at your site and providing some pointers. Email me. Good job on increasing from last month! You're doing great! I always love seeing these reports! They help me compare and see how well I'm doing, or what I'm lacking! It looks like this month was a good one for you! Keep up the good work! What a great month! You're continuing to build your income. I love seeing how your page progresses! My income is pitiful, but I haven't really done much about it. Thanks for the motivation! I'm sure you could benefit from me taking a look at your site and providing some pointers. Email me. You are so inspiring and I really appreciate that you share all this information. Can't wait to watch you reach your goal! I love that you are so transparent and what great numbers considering your pageviews. I think you have such great potential! I really love that you share your info with us. It's really hard to have any idea at all what the potential is when you start, and this is a great guide! Posts like these help me so much! Thank you!!! Geez Louise! This is A W E S O M E! Signing up! I definitely need to pick your brain on affiliate marketing. I can't seem to make anything using it! Congrats on the hard work. I love sponsored posts. Teach me your ways! haha I have similar stats, but I have only just started trying to monetize my blog. I've started with sponsored posts, but have just started looking into affiliates. Who is your favorite to work with? Great job. I'm working to double and triple my traffic in the next few months. Let me know how I can support you! Donella @ Wife. Mom. Geek. This is really inspiring to me! I've only been blogging a few months, so I'm just starting to do sponsored posts. You did great, especially for being unable to do much blogging for most of the month. Thanks for the motivation!